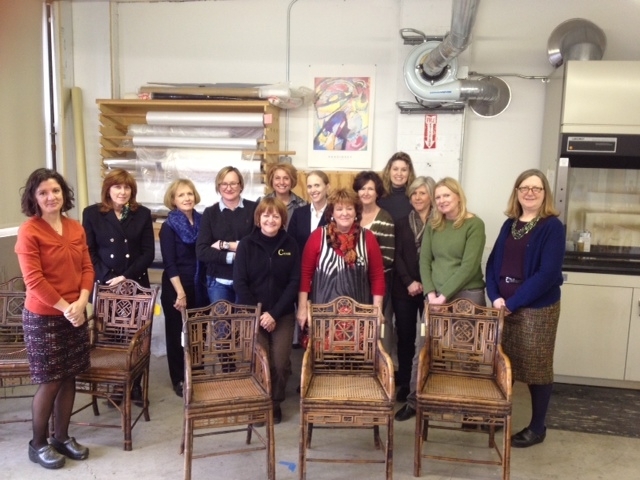 The Ogden Codman Design Group, a special Historic New England membership group for design professionals and enthusiasts, recently went behind the scenes at our collections facility in Haverhill, Massachusetts. Senior Curator Nancy Carlisle led members through storage areas, pointing out special paintings, textiles, ceramics, and furniture. She hand-selected unique objects for this group, allowing members to closely examine window coverings and toile fabrics. Objects Conservator Michaela Neiro explained Historic New England’s conservation treatment philosophy and showed visitors current projects in the lab. This is one in a series of exclusive events for Ogden Codman Design Group members offered throughout the year. Learn more. The next behind-the-scenes tour of the collections facility takes place in September 21 and is open to all Historic New England members. Join or renew your membership today.